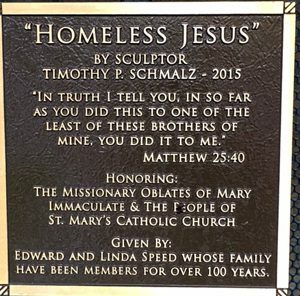 While in San Antonio for a conference last week, I passed a statute called “Homeless Jesus” in front of St. Mary’s Church in downtown. It stopped me in my tracks. How many times have I passed a real person on a bench and just kept going, touched slightly perhaps but not moved to stop? When we don’t put the label of “other” on others, we find the source of compassion deep within that we’ve silenced in a hurried world. We appease ourselves with “it’s the church’s or the government’s job” to take care of them. We are the church, we are the government. 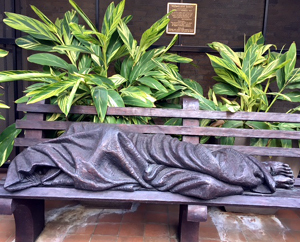 And while a program will attend to the basic needs, human connection and dignity go to the heart of a human being who somehow ended up on a bench. Whether on a bench or in the coffee shop, many people are struggling to merely get through the day. Don’t race by those who cross your path without noticing and being kind. If you do, you may miss Jesus. I absolutely love this post. Such a stunning sculpture and reminder . Thank you. Thanks so much! Cast light!